I liked how the ref (by breakermorant1066 in DA) gave me an opportunity to study the sub-shapes (or should I say supra-shapes?). 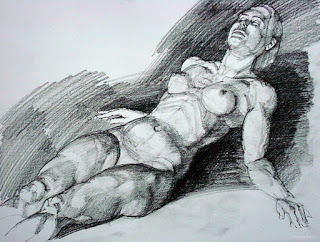 Also the lithe form of the model wonderfully lends itself to structure interpretation. There is such divine rhythm in the human body! A3 size, conte stump and pencil.